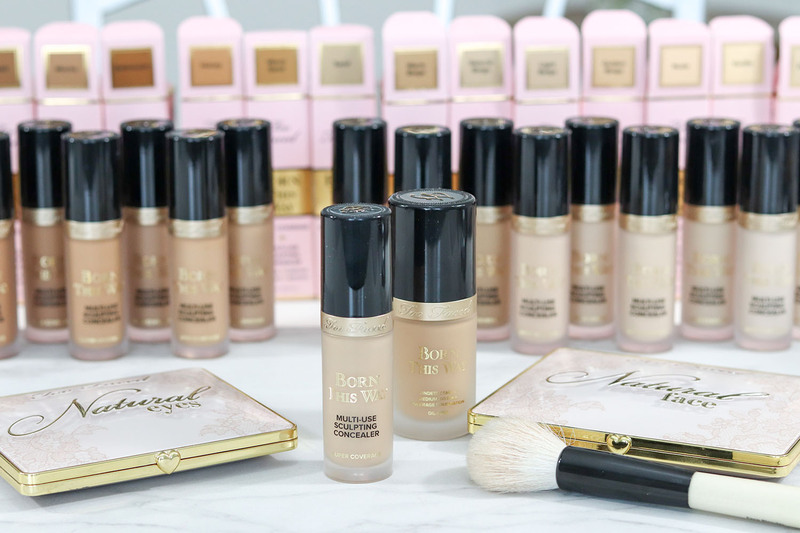 The Too Faced Born This Way foundation has a huge following for a reason: it’s a long wear, medium-full coverage foundation with a natural finish that’s literally created to look like you were born completely flawless. 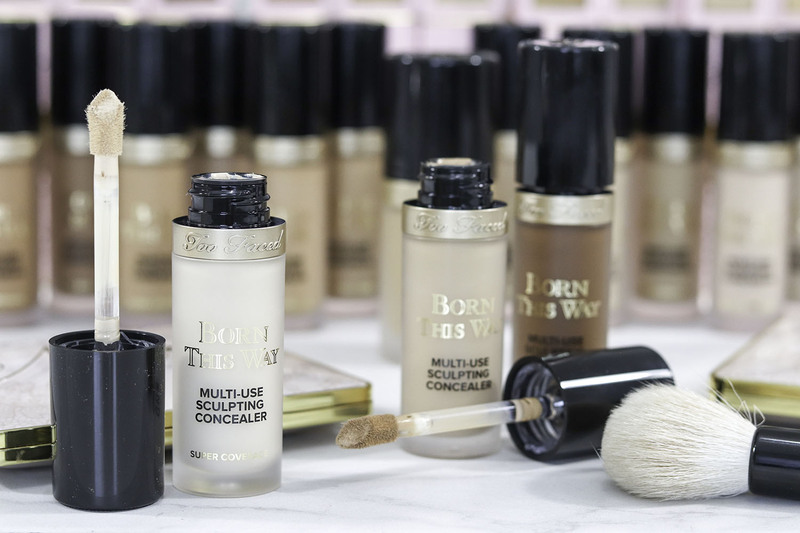 The brand recently expanded the Born This Way line to include 20 super-coverage concealers that can be used to conceal (as usual), contour, highlight and retouch and fans are SO EXCITED! I was very lucky to be gifted all 20 shades to share with you today in a review, YouTube demo and wear test… so let’s get into my Too Faced Born This Way Multi Use Sculpting Concealer Review. If you’re new to the brand or the Born This Way line, Too Faced has a few items already in the Born This Way collection. Born This Way Foundation – available in 35 shades for undetectable, medium-full coverage. Oil free, hydrating and photo-friendly. Born This Way Ethereal Setting Powder – available in 3 adaptable shades – translucent, medium, deep – to set makeup with a natural, luminous finish. *NEW* Born This Way Multi Use Sculpting Concealer – available in 20 shades as a super coverage, hydrating, multi-tasking concealer. Crease-free, weightless, and photo-friendly. 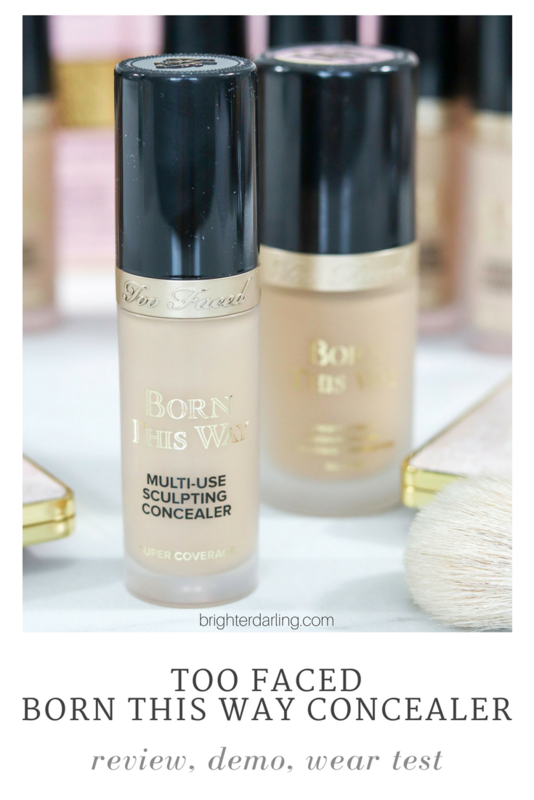 When I first saw all of the shades of the Too Faced Born This Way Concealer ($29), I wasn’t as shocked by the amount of options (although, impressive), I was immediately taken aback by the HUGE BOTTLE! Naturally, I had to research the quantity of product included against other popular, medium-full coverage brands. Too Faced Born This Way Concealer – .5 fl oz. Tarte Shape Tape Concealer – .33 fl oz. NARS Radiant Creamy Concealer – .22 fl oz. Maybelline Fit Me Concealer – .23 fl oz. Maybelline Instant Age Rewind Concealer – .20 fl oz. …drugstore doesn’t look AS cheap anymore, huh? Check out that comparison with the Maybelline Age Rewind vs. the Too Faced Born This Way! After I adjusted my vision for the massive tube of concealer, I took in all of the shades. 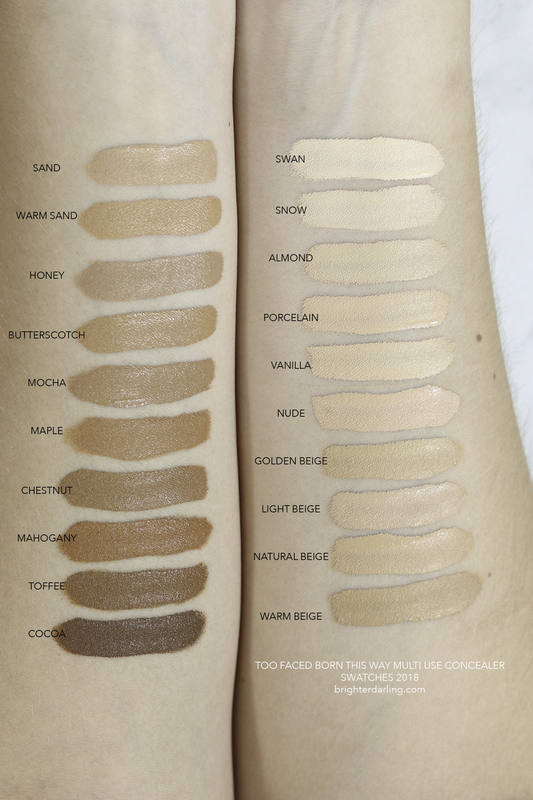 20 shades in a concealer is pretty impressive. After the size and shade range, I looked at the product claims… mainly the full coverage and hydrating claims. When comparing this to the popular – and what I believe is the biggest rival – Tarte Shape Tape, Too Faced is 100% more hydrating. It has a naturally radiant finish that seems to set down without creasing too badly under the eyes (I’m a firm believer ALL concealer creases under the eyes…). Tarte Shape Tape leaves a more matte, flat appearance. Both Tarte and Too Faced provided photo-friendly, full coverage, but the Too Faced was more forgiving on the skin. This is key for those with drier skin, fine lines or wrinkles. As for long wear, comparing it to the Tarte Shape Tape again, Too Faced held up beautifully. I have seen no weird breaking down, flaking off, looking dry in my two weeks testing this formula. Regarding photo friendliness, Too Faced scores again with zero issues in photography – just as nice as Tarte Shape Tape. In terms of contouring, this is where I have a bit of a learning curve to tell you about. Since the concealers are very pigmented and creamy, I found myself overdoing it a little compared to using a standard contouring stick/cream. You basically need a 1-3 dots of darker concealer to contour… more than that, you’ll make a mess. Besides the learning curve there, the deeper shades seem to blend out flawlessly. I believe that Too Faced nailed this Born This Way concealer formulation for those who wanted to love Tarte Shape Tape, but found it too drying/unforgiving on their skin type. The shade range is amazing (and I’m sure Too Faced would add more shades, if this new release goes well (which it seems to be)), the value is incredible and the claims completely live up to the hype. If you’re looking for a new concealer that works well to conceal, contour and highlight, you have the Brighter, Darling seal of approval to check out the new Too Faced Born This Way Multi Use Sculpting Concealer because I haven’t been able to put it down! Pick it up at toofaced.com, Ulta or Sephora. "10 Nordstrom Anniversary Sale 2018 Baby Picks"
"Product To Try: Drunk Elephant D-Bronzi Review"